Lion Corporation (President: Itsuo Hama) announces the nationwide release, on Wednesday, February 13, 2013, of “Ban Shower Deodorant,” a new aqueous antiperspirant that offers protection against odor for the entire body thanks to deep nano ion sterilization and that is blended with proprietary micro powder ingredients to provide a long-lasting feeling of smooth skin. “Ban Shower Deodorant,” which is applied as a mist spray, leaves skin feeling fresh and dry, removing the sticky feeling of perspiration, much like taking a shower. Applied once in the morning, it provides all-day comfort and frees the user from worry about perspiration and odor. For women who desire a refreshing start to their day, Lion proposes the new habit of using “Ban Shower Deodorant” in the morning. A Lion survey revealed that 61% of working women in their 20s and 30s are concerned about body odor. Of this number, 84% use deodorants each morning before they go to work. Moreover, 59% of them apply deodorants to not only their underarm areas but their backs, necks and other body parts. This seems to indicate a high awareness of the need to address body odor. Furthermore, the survey revealed that, for those who regularly use deodorants in the morning to control perspiration and odor, this practice also seems to refresh them and “switch on” their minds as they get ready for the day ahead. On this occasion, Lion Corporation will release “Ban Shower Deodorant,” a new aqueous antiperspirant that, by controlling odor and offering a long-lasting feeling of smooth skin, provides a “just showered” feeling. Lion is a staunch supporter of working women, encouraging them to feel confident and keep smiling throughout the day by offering the “Ban” series, which can resolve their concerns over body odor at any time and in any place thanks to nano ion technologies. 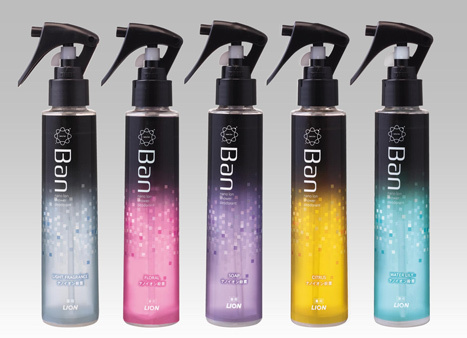 Under the keywords “Ban & Go,” in 2013 Lion proposes that such working women adopt the new habit of using “Ban Shower Deodorant” in the morning. This will, in turn, raise their spirits prior to any occasion, such as going out. In doing so, Lion aims to help women maintain a positive and active attitude. The nano ion antibacterial agent benzalkonium chloride deeply penetrates the pores to sterilize odor-producing bacteria. Our proprietary micro powder, which is frictionless on the skin, controls sticky perspiration to promote a sustained feeling of extreme smoothness. Featuring a container equipped with a user-friendly trigger that operates even when the container is inverted, users are able to spray the product anywhere on all their body, including the neck, arms, chest and such hard to reach areas as the back.